I love corn and I love Nachos; so I brought them together with a unique dressing to create this delectable mouth-watering treat that’s super easy to make and a different dish to serve. 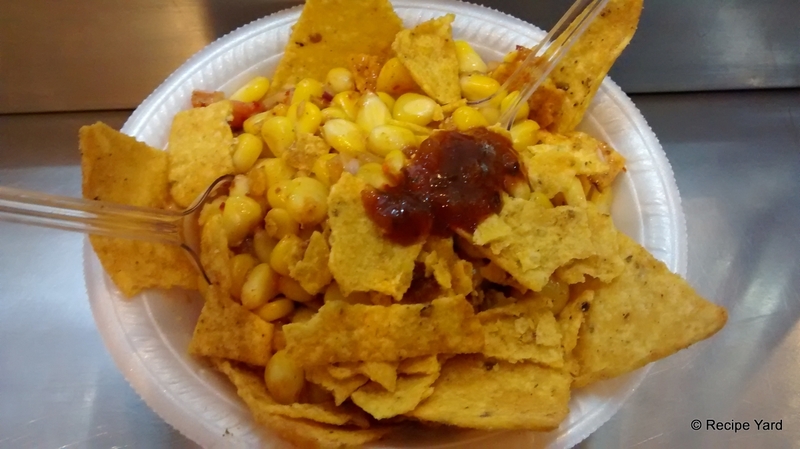 This corn-nacho chat is just one of the many sweet-and-spicy quick snacks Indians love. But now you don’t need to go to a road-side vendor to have them. This chat can easily be made at home with simple ingredients. Combine the salsa, mayonnaise, salt and chat masala in a bowl. Tip: You can use readymade salsa sauce or a homemade one. Click here for an easy recipe to make restaurant style salsa sauce at home. Add the chopped onion and tomato to this dressing. Now add corn and with your hands crush some nachos into as well. Mix everything with a spoon. Drizzle lemon juice over the chat, check and adjust seasonings and finally mix again. In a serving bowl arrange unbroken nachos at the sides and then spoon in the chat in the center. Top with some more unbroken nachos and a bit of salsa sauce. Serve immediately.